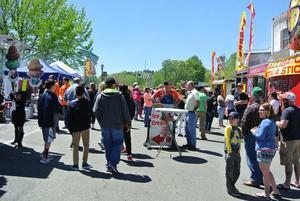 The City of Cornelia hosted its 5th Annual Cornelia Apple Blossom BBQ Festival in Downtown on April 15-16. 44 KCBS certified competition teams traveled from all over the Eastern United States to participate in the festival. Even the top five teams in the country spent the weekend in Downtown Cornelia to compete for the prize payout, the bragging rights, and the opportunity to compete in a nationwide event. The Apple Blossom BBQ Festival is actually a qualifier for teams who are trying to make it into the Jack Daniel’s Competition in Kansas City for the biggest win in the league. The professional teams have to turn in a pork, rib, brisket and chicken dish. Each category is judged by professional KCBS judges, and then the points are tallied to determine an overall winner. Some of the scores were only off by a tenth of a point. Apple Blossom Competition, moving "Smoke on This", the first place team into the second place rank in the points standings. 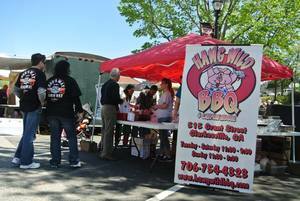 The "Atlanta BBQ Store" also racked up points and money by placing in all four categories, and a second place overall finish. For a full list of the winning and competing teams, visit their website here. Along with the competition, was an opportunity for people to come and enjoy tastings of the team’s work. Thousands of people came out to enjoy the perfect weather. Mike Owensby, a local food lover, challenged the reigning rib king, Phillip Kimbrell, to a rematch after he just barely lost in the 2015 competition. He won in double overtime. Community Development Manager Jessie Owensby said, “I knew this was going to be a fun competition to watch. These two have been talking about it for the last couple of weeks." Visitors were also able to enjoy the annual Chopped Competition, which also had some stiff competition. Habersham Chamber of Commerce President Judy Taylor was the reigning champ for two years in a row. She lost out this year to Jacque DeLock with Sheriff Joey Terrell coming in a close second. 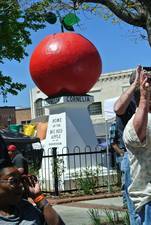 Interested in learning more about what happened at the Cornelia Apple Blossom BBQ Festival, and getting the dates for next year? Head over to their Facebook page.